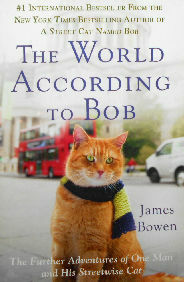 Here are the further adventures of James Bowen and his street wise cat Bob. In this follow up non fiction book the story of their life together is published. Suddenly everything has changed for this man and his cat. The paperback book is 5 1/2" Wide x 8 1/4" high. Copyright 2013, 286 pages. Previously owned but in good condition.